As part of the Together with Birds Project, participants learn about the birds of their community, their way of life, and their problems. After conducting research and making observations, they share information with each other through photos and essays. 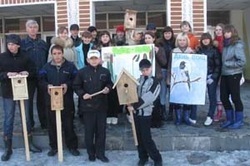 During the project, various competitions and actions directed at the maintenance of populations of birds of a city will be offered and participants will be encouraged to adopt or adapt the activities of global peers for use in their own communities.